The rapid increased population of Western Tussock Caterpillars has spread worry around the Bay Area as the furry insects can cause rashes if touched, especially in children. Marianne Favro reports. The rapid increased population of Western Tussock Caterpillars has spread worry around the Bay Area as the furry insects can cause rashes if touched, especially in children. 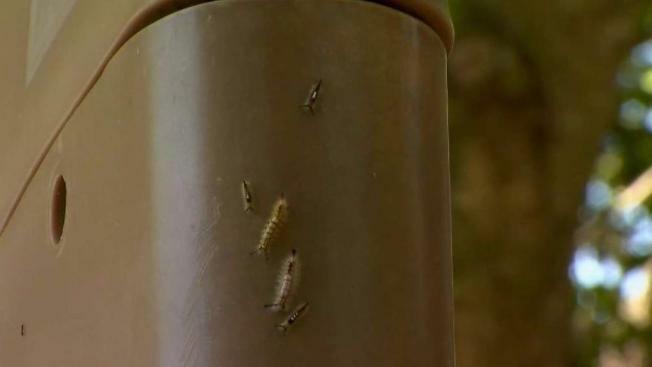 Though they are native to the Bay Area, experts say that there has been an explosion in caterpillar population, causing hundreds of them to drop from trees in the South Bay prompting calls to the Santa Clara County Agriculture Division. "I would say a million, a bunch of caterpillars, tons and tons," said four-year-oldd Jack Bryden from Los Gatos. Though the caterpillars can destroy a lot of leaves and plants, the big concern is the health effects it can have on those around them. "People want to touch them because they are furry, but the hairs have barbs and if your skin is tender they will get in there and causes a rash on your hand," said Joseph Deviney from the Santa Clara County Agriculture Division. Bay Area pediatricians have seen several patients with rashes recently but cannot confirm they were caused by contact with the insects. Experts say the caterpillar population is skyrocketing thanks to an increase in the food supply and a decrease in predators and diseases that kill the critters. If a child develops an immediate reaction to a caterpillar, it is recommended they remove the tiny hairs with a piece of tape and wash the area. Most reactions go away in a few days but if it seems more serious, parents are to contact their pediatrician.